﻿ Street Racing Inuries | SSR - Stop Street Racing || ...if your serious about winning, take it to the track. There is simply too many dangerous activities going on all around us on the roads and highways of our communities. We must work together to turn the corner on these stupid street antics. Add the non-emergency number to your local Police Departments to your cell phone, along with your state's Highway Patrol and call in the stupid acts you encounter while driving. Street racing puts every person on the highway in harms' way, including all those NOT street racing or acting a fool. Let's put an end to the tragic road games being done all across the world. 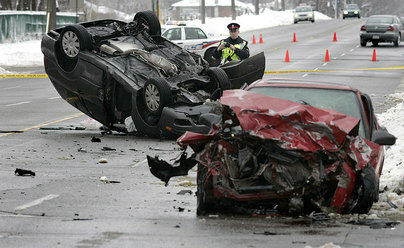 Street racing is a deadly game that puts not only you, but also innocent lives, at risk of death or serious injury. You also risk having your license revoked for 10 or more years, having your vehicle impounded, sold or crushed and losing gainful employment for many years to come. Most employers are required to run your license for insurance purposes (even if you do not drive a company vehicle) and must refuse to hire you when they become aware of your illegal street racing conviction. Copyright © 2008-2014 SSR - Stop Street Racing / New Speed LLC. All Rights Reserved.